All two bedroom units. Two persons minimum must occupy. All USDA Rural Housing Service subsidized. Your rent will be 30% of your income. Welcome! 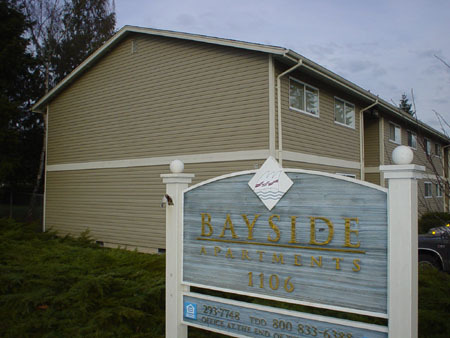 Bayside Apartments is located in beautiful Anacortes, the gateway to the San Juan Islands. Bayside is affordable housing conveniently located walking distance from downtown shops, restaurants, offices, hospital and schools. All of Bayside 20 units are non smoking 750 square feet, two bedrooms 1 bath, and include the following amenities: Cable TV Hookup, Carpet, Garbage Disposal, Child Play Area, Garden like Setting, Handicap Accessible Units, Laundry Room on Property, and Off Street Parking.